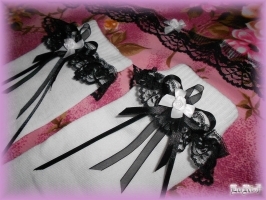 Cuffs from Albica-atra collection based on black cotton lace and handmade decoration from satin ribbons. 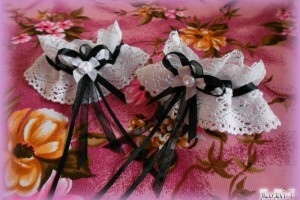 Cuffs from Albica-atra collection based on white cotton lace and handmade decoration from satin ribbons. Black headbow with with decorations from Albica-atra collection. Black headband from Albica-atra collection with white cotton base decorated with black lace and black half-transparent ribbons.